A recall was being issued in San Francisco of three politicians. The East Oakland Progressive League was throwing it’s support behind the politicians and against the recall. 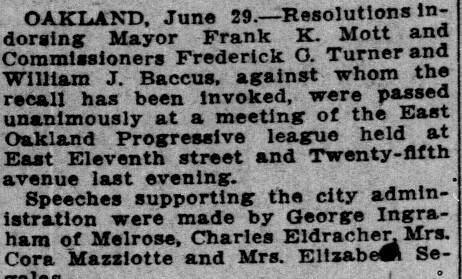 Listed as one of the members of the East Oakland Progressive League was Mrs. Elizabeth Segalas (name cut off). Elizabeth was also known as Elisa Anna (Lascurettes) Segalas, the wife of Albert Segalas, my Grandpa Lassalle’s cousin. Albert owned the Model French Laundry in Oakland, California. Elise Anna was also mentioned in an article from the previous day about the same issue. I have yet to find a female relative who was active in the suffragist movement. This is the earliest mention I have of a female relative being politically active–and in the progressive party no less! Women in California won the right to vote in 1911, so her participation in this group doesn’t necessarily mean that she was marching for the right to vote prior to 1911. In the article above, she made a speech, so it sounds to me like she was comfortable voicing her opinions in a public forum. I notice something interesting about this group and Elisa Anna’s participation. Mostly I have found my French relatives involved in organizations within the French community. Whether they are political or fraternal, they are always organizations filled people of French descent. Elisa Anna is the first person from this side of the tree that I’ve found (so far!) in an organization not specifically rooted in the French community. I am sure I’ll find others, but it is interesting to note. It probably shows how the second generation, the ones born in California, began to split from their parent’s background. Once again, newspaper research turns up a tidbit about my relatives that I would otherwise know nothing about.